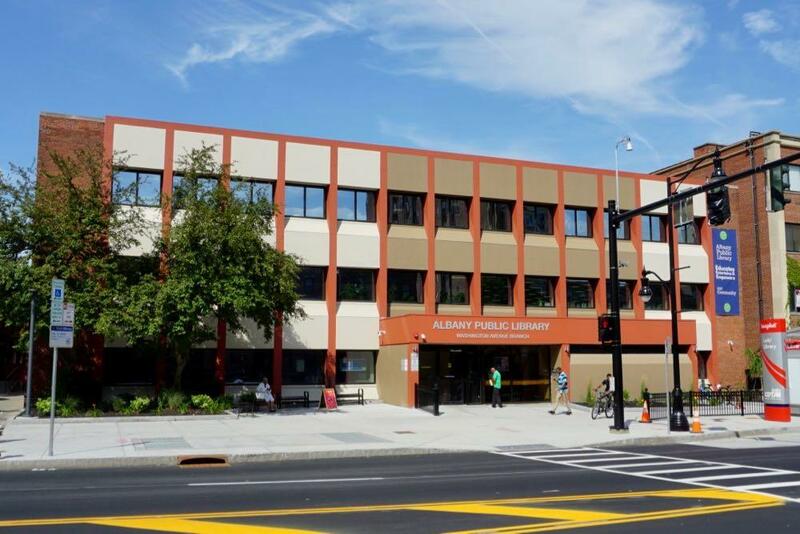 The Albany Public Library announced today that it's eliminating late fines for books, DVDs, CDs, and audiobooks starting January 1. It's also waiving previously racked-up late fees for these types of items. But if there aren't fines, what's going to prompt people to bring books back on time? Well, you might be surprised about how that works now. "'The Prolific Magic Egg' is a 1903 short film directed by and starring Georges Méliès. 'Sherlock Jr.' is a 1924 film directed by and starring Buster Keaton. Psychedelic Snakeskin will provide the live accompaniment using analog and digital instrumentation to bring attendees sound-collage music from the outer edges." "This 1923 film stars Buster Keaton and showcases the wonder of love and romance through three historical periods. [Ryan] Devine plays keyboards for a number of local bands, is a member of Victory Soul Orchestra, and teaches piano." 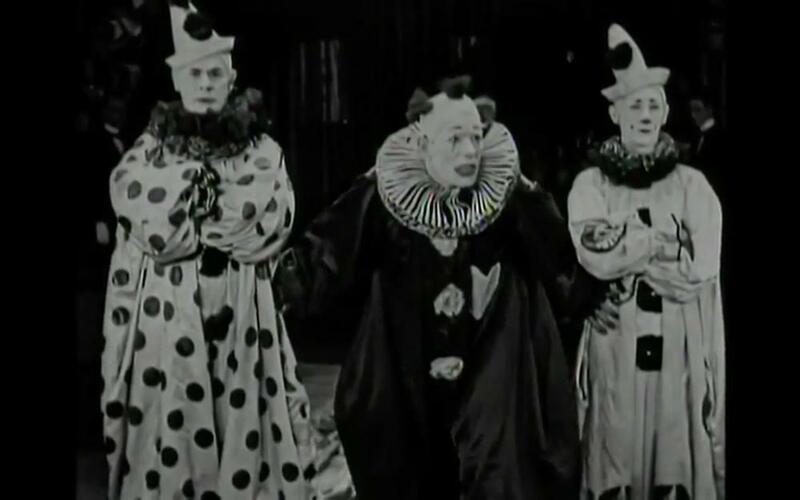 "Lon Chaney plays a bitter clown in this 1924 film. Jennings is lead singer and guitarist for popular local band Front Business. He is new to the Silent Film Spectacular this year." The films start 7 pm. 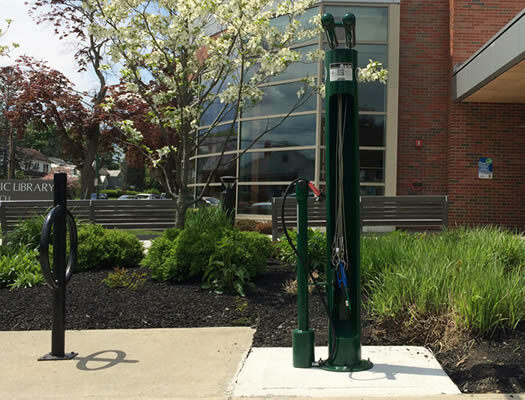 This looks interesting -- a use of new tech to help tell an important local history story. Come learn about the African-American history of Great Migration from Mississippi to Albany, New York, and its connection to the South End. 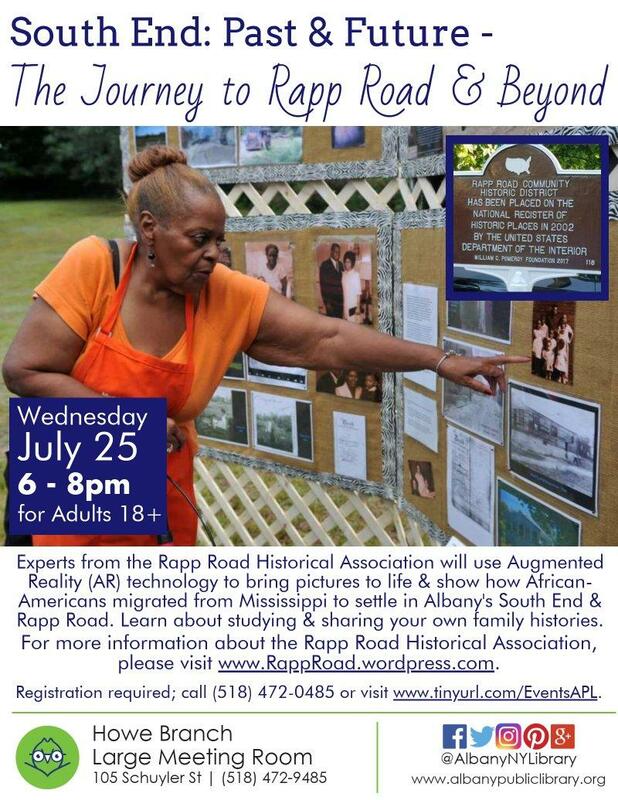 Experts from the Rapp Road Historical Association will use Augmented Reality (AR) technology to bring pictures to life and show how African-Americans migrated from Mississippi to settle in the South End and Rapp Road. They will also share new opportunities for studying and sharing your own family histories. Light refreshments will be served. The event is Wednesday July 25 at 6 pm at the beautiful Howe Branch (105 Schuyler Street). The event is free, but registration is requested (see the link for details). Come learn the craft of crime fiction writing in this 4 part series! Local criminal justice professor and mystery writer Frankie Y. Bailey will lead this hands-on program for patrons of all experience levels. This program is designed as a four-part series, but participants who are unable to attend every module are still welcome to sign up. The class is on Mondays at 6 pm starting July 9. It's free, but registration is required. Bailey is a professor in the School of Criminal Justice at UAlbany. 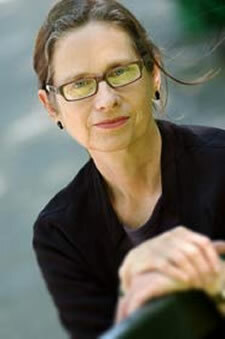 And she's written a bunch of mystery / crime novels, including a near-future detective series set in Albany. Bailey will be honored with Alice Green at the Albany Public Library Foundation's Literary Legends Gala October 20. The 1906 silent film The ? Motorist. The films start each Wednesday at 7 pm. Admission is free. 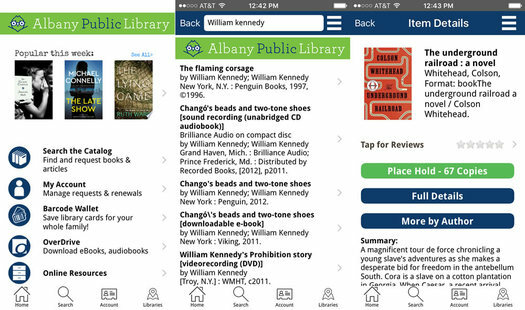 Check it out: The Upper Hudson Library System has moved to a new app, which includes the Albany Public Library and many other local libraries. * Place, check the status, or cancel holds. There's also info in the app about library locations and events. Another feature that's fun: The app can scan a book's barcode (via the phone's camera) and check the availability of the book in the library. The app is available for both iOS and Android. It's free. The Albany Public Library's Silent Film Spectacular series returns for a new season this month. 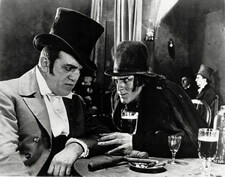 The series shows old silent films with a live performance of the score by local musicians. 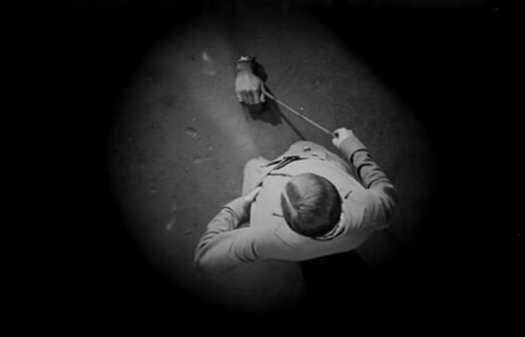 "This 1929 film showcases urban life in a Russian city through the eyes of a cameraman. The band is a three-piece ensemble that renders sensitive folk ballads submerged in chaotic experimental noise landscapes." "These three short films, created between 1923 and 1929, explore notions of romance, fantasy, and horror in experimental and surrealist fashion. The band crafts pieces of contained chaos, as the massive and distorted rhythmic backbone of the songs undulates between flurries of melody and flourishes of chaotic improvisation." The performances start at 7 pm in Washington Ave branch's large auditorium. They're free. Anyone interested in Albany's storied past is invited to participate in this "Amazing Race"-style scavenger hunt around the city. For this year's race, the Albany Public Library is partnering with Historic Albany Foundation and showcasing the endangered buildings of our city. Over the course of a couple of hours on that Saturday afternoon, teams will receive clues and location histories written by Historic Albany Foundation and dash around Albany making quick stops at historic locations. The final stop of the race is McGeary's Pub (4 Clinton Sq.) where all participating teams will receive 20 percent off their food and drink that day. The fastest teams will receive bragging rights and prizes from The Albany Distilling Company, Historic Albany Foundation, and other Albany businesses. The event starts at 1 pm on Saturday, September 24. It's free to participate, but registration is required (registration starts September 1). See the link above for details. Bus tours. Bike tours. Walking tours. Yep, sure. Running tour? That's a new one to us. 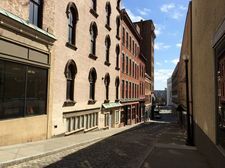 Explore 2.5 miles of historic downtown Albany as a pair of running librarians lead you and a small group of participants on a narrated history run through our city! If you can comfortably run an 11 minute mile (5.5 mph) over 2.5 miles, you'll have no problem keeping up. We'll take three short breaks at historic points along the way. Lace up your sneakers, bring headphones or borrow some of ours. We'll provide a digital audio player you'll hold while running containing a narrated audio tour. The tour was developed from information gathered in our library's Pruyn Collection of Albany History, local history blogs, and other resources! The first tour is Saturday, July 9 at 10. There are four more tours scheduled over the course of July and August, three on Saturday mornings and one on a Wednesday evening. The group meets up at the Albany Heritage Area Visitors Center at Quackenbush Square, and the morning tours end at The French Press Cafe and Creperie and the evening tour at McGeary's. The tours are free, but registration is required. Details at the link above. The famous Odessa Steps scene from Battleship Potemkin. The Albany Public Library's Silent Film Spectacular series returns for another season in April. The APL will be screening silent movies with live soundtracks performed by local bands. The screenings are each Wednesday in the large auditorium of the APL branch on Washington Ave, starting at 7 pm. They're free. 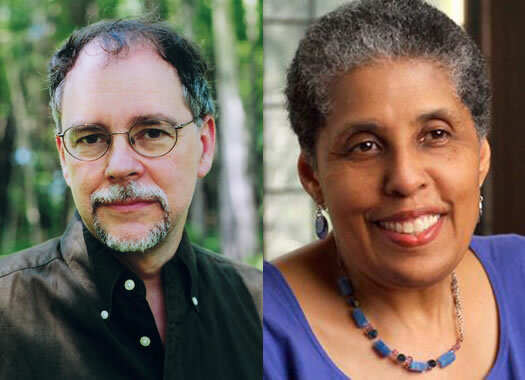 The Albany Public Library Foundation's Literary Legends gala returns November 14 -- and it will be honoring Gregory Maguire and Barbara Smith. Maguire is the author Wicked, which was, of course, adapted into the huge Broadway hit. He grew up in Albany's Pine Hills neighborhood and graduated from UAlbany. 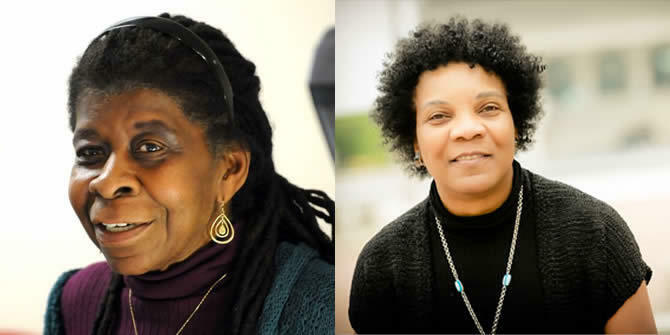 Smith is a noted activist and author, and longtime Albany resident who served on the Common Council. The Literary Legends gala is a fundraiser for the Albany Public Library. It includes live music; food catered by CafÃ© Capriccio, New World Bistro, Saati's, and Yono's; a silent auction, and the awards ceremony. It's Saturday, November 14 at the APL's Delaware Branch. Tickets are $75 and available online. AOA is a media sponsor of the Literary Legends event. The 1924 version of Peter Pan is among the silent films on the slate. The Albany Public Library's Silent Film Spectacular returns for another season this month. The APL will be screening silent movies with live soundtracks performed by local bands. 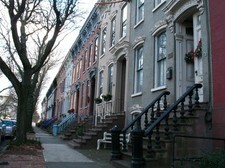 Anyone interested in Albany's storied past is invited to participate in this "Amazing Race"-style scavenger hunt around the city. Over the course of just a few hours on a Saturday afternoon, teams will receive clues and dash around Albany completing challenges. The final stop of the race is McGeary's Pub (4 Clinton Sq.) where each participating team will receive 20 percent off their food and drink that day. The top three teams will receive bragging rights and prizes. 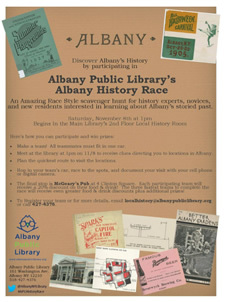 The hunt begins at the Main Library's Albany History Room at 1 pm on Saturday. It's free to participate, but you must register (and you can do so online). We'll begin the evening with some challenging team competitions to test your spelling skills. Then we'll start the main event where one member of each team competes in a traditional spelling bee. Teams may swap out players throughout the event, allowing for everyone to participate if they'd like. Snacks will be provided and the best teams will be handsomely rewarded with prizes. Teams can include 2-5 adults. It's free to participate, but registration is required: call 427-4376, or email aplp1@albanypubliclibrary.org. The bee starts at 7 pm on Thursday, September 18. The Pine Hills branch is on Western Ave near the merge with Madison Ave. So there's that whole strip of restaurants just across the street for you team to celebrate its victory after the bee. Party Boat is one of the first bands up in the series. The Albany Public Library is bringing its "Garage Bands" series back this summer. 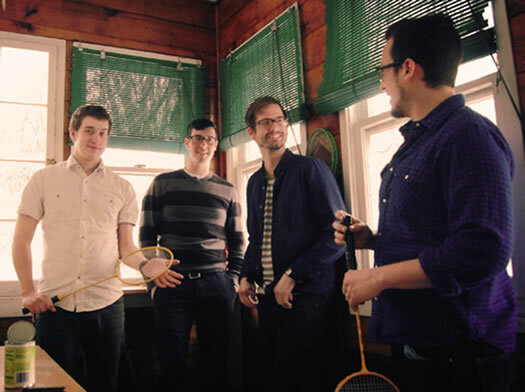 The shows feature local bands playing in the garage of the APL's main branch on Washington Ave. The all-ages shows have an early start and end time (6-8 pm), so they can be a good event for people with young kids. And they're free. The first show is this Friday, July 18. The full slate is after the jump. A view of Broadway from the corner of State Street in 1910. The Albany Public Library has a pretty impressive collection of the city's history in the Pruyn Room -- its local history room at the main branch of the library on Washington Avenue. And as of this week, for the first time, some of those images are now available online. APL has been working with New York Heritage -- "a free online portal designed for researchers and history buffs" -- to digitize the collection in the Pruyn Room. 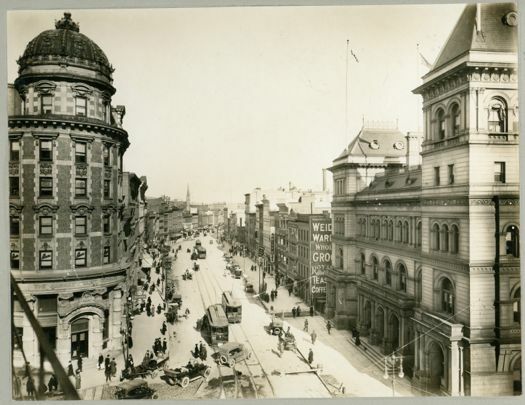 The library's starting with a series of photos from the late 19th and early 20th centuries, and an interesting scrapbook with before-and-after shots of downtown Albany, the O'Brien Federal Building, and 787. APL's creative librarians have come up with some non-traditional geography challenges based on kids' games. 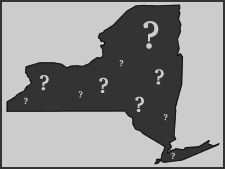 Instead of "pin the tail on the donkey," you'll play "pin the city on the state." You'll use your best crayon skills to draw maps. 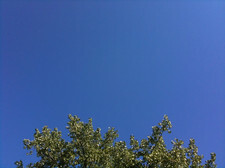 And, you'll do some local Google street-view stalking to figure out where in the world Carmen Sandiego's been hiding. There will be prizes for the best teams, along with state-shaped cookies and other snacks for participants. This is a follow-up of sorts to APL's spelling bee for adults last fall, which we hear was a lot of fun. The geography bee is from 6:30-8 pm this Thursday, March 13. It's a team competition, and teams need to register ahead of time because space is limited. Registration is free. 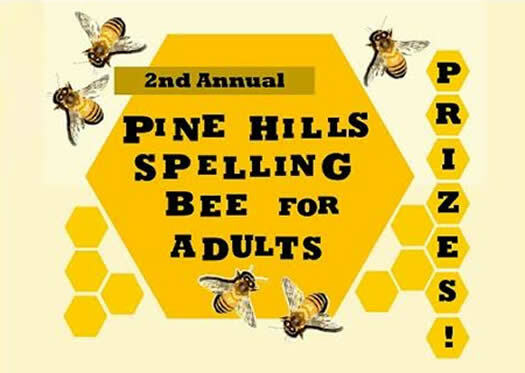 To register, call the Pine Hills branch at 482-7911 ext. 230. And that branch is pretty much across the street from a whole strip of restaurants/bars -- from Tierra on up to the Madison Pour House -- if you're looking for someplace to grab a drink or something to eat afterward. That's an entry from @thebeatenpoet in the Albany's Public Library's Summer in the City PoeTweet Contest on Twitter. One Tweet = one entry. You can submit one entry per day; your Tweets must be your own. (So, you can have up to 7 chances to win.) The subject of your Poetweet must be "Summer in Albany." Include #APLMRS in your Tweet so we can find it. The winner will be selected by poet Dan Wilcox "based on creativity, originality, and poetic skill." The contest runs through August 3 at 11:59 pm. You can follow along with the entries by watching the hashtag #APLMRS. Yep, APL advertises on AOA.